As an integral part of our kitchens, garbage disposals are something that most of us cannot live without. The ease and convenience of being able to toss our food into the sink are so ingrained in our daily routine that it seems bizarre not to have such a luxury. However, if you are looking to either upgrade your current disposal system or you want to get one installed so you can experience the good life, then you most likely want to do a bit of research first to figure out which model is the best. Fortunately, we’ve done all of the hard work for you, and we have compiled a list of the top manufacturers of garbage disposals so that you can do a side by side comparison. This way, you can make an informed decision and ensure that the machine you choose for your kitchen will be up to the challenge. These manufacturers produce top garbage disposals available on the market. 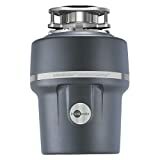 This is by far one of the most well-known brands in the field of garbage disposals and a big reason why is because they make some of the most sturdy and long-lasting models. In fact, this company is the world’s largest manufacturer, making and selling millions of units every year. It was founded back in 1927, and they make disposals for both public and commercial use. Also, the brand is known for making hot water dispensers as well. InSinkErator is a subsidiary of the Emerson Corporation, and it is located in Racine, Wisconsin. There are two primary product lines that InSinkErator offers: the Badger and the Evolution. Both lines come with the brand’s signature features, which included a Quick Lock mounting bracket so that you can swap out models quickly, a continuous feed system for convenience, and durable stainless steel impellers. Nonetheless, there are some crucial distinctions between them as well. This line only has three models; the 5XP, the 5, and the 1. They are rated in order of horsepower, with the 5XP containing 3/4 horses and the 1 having just 1/3 HP. The defining characteristic of this line is that they are more compact, making them ideal for smaller homes and kitchens. Each Badger is made of galvanized steel and uses InSinkErator’s patented Dura-Drive motor to ensure longevity. If you want a disposal with some personality and heft, then this is the line from which to choose your model. There are five iterations of the Evolution: the Excel, the Compact, the Cover Control, Septic Assist, and Essential XTR. Unlike the Badger series, these disposals are larger and come with more robust horsepower. They are also all made of stainless steel instead of galvanized so that they repel rust and corrosion much better. Other features of the Evolution series include a Sound Seal that keeps them quiet, a multi-stage grinding system to process food faster and more thoroughly, and a larger chamber to hold more material at once. Overall, InSinkErator has some world-class warranties for its products, but it depends on the model that you buy. For example, Badger Disposals usually have only a one-year limited warranty that covers parts and labor. Evolution models, however, can be covered for up to seven years with an in-home full-service warranty. As such, by upgrading to the power of the Evolution, you are also getting a much better deal regarding support and service. InSinkErator has a rather lean support page, but it is full of practically all the information you need, including where to find a technical support center near you for repairs. Other options they offer include DIY repair instructions, such as how to unclog or replace your disposal. These instructions are illustrated and have accompanying video to help you out. Otherwise, you can contact the company directly through email or phone, which you can find on its Contact Us Page. 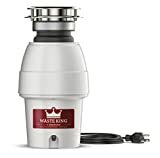 With a name like Waste King, you know that this company specializes in garbage disposals. One of the most notable things about this brand is that it offers an extensive collection of different models to fit your needs. 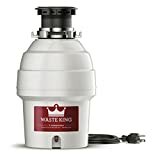 Waste King is a subsidiary of Anaheim Manufacturing, which itself is a subsidiary of Moen Incorporated. Although Anaheim Mfg. produces hot water faucets and tanks, as well as disposals under the Whirlaway brand, Waste King is solely focused on garbage disposals and related accessories. Anaheim Mfg. was founded in 1955 and is based in North Olmsted, Ohio. Waste King classifies its disposal units into three categories: EZ Mount, 3-Bolt Mount, and Batch Feed. Each classification has a variety of models that differ based on size, horsepower, and warranty. The EZ Mounting system is designed to make it easier to swap out different types as you see fit. So, if you want to upgrade to something larger and more powerful, you won’t need to install a new bracket. The 3-Bolt Mount is also simplified, but it doesn’t twist and lock as the EZ system does. Batch Feed models can use either mounting system, depending on the exact model that you get. Overall, Waste King disposals range from 1/3 to 1 horsepower. They are all made out of stainless steel to reduce rust and corrosion, and they all come with stainless impellers as well. Each model includes a removable splash guard and is insulated to reduce the amount of noise it produces. Also, another primary selling point of this brand is that it includes power cords with every unit, unlike some other companies (such as InSinkErator). The duration of the warranties offered by Waste King varies greatly, with some models coming with just a year of service and others including a limited lifetime warranty. There doesn’t seem to be any particular distinguishing features that would indicate why there is such distinction, but the warranty rates are usually offered in 1, 2, 5, 8, and 10-year increments, not including those with a lifetime guarantee. There is some literature available on the company’s homepage that offers instructions on how to install your disposal unit and perform basic repairs. If you have any questions, there is just a phone number, which is listed at the top of the homepage for your convenience. Related: Waste King vs InSinkErator – Which Brand is the Best Garbage Disposal? Unlike the companies above, KitchenAid is well-known for a variety of household appliances, not just disposals. In fact, most people probably don’t even realize that the brand offers garbage disposals in addition to the wide array of mixers and blenders and other food preparation devices. The company was founded in 1919 when it produced its first stand mixer. Currently, it is owned by the Whirlpool corporation, and it is based in Benton Harbor, Michigan. Since disposals are just a small part of the company’s product line, there are fewer models from which to choose. Also, the quality and reliability are not as great as brands like InSinkErator, because disposal technology is not KitchenAid’s forte. There are five different units offered in the KitchenAid line, and they are mostly continuous feed models. Three of them are classified as a Superba model, meaning that they come with a sound seal to reduce overall noise, a multi-stage grinding system, and a jam sensor to prevent overloading the circuit if the unit stops working. One of the Superba Disposals is a 1 HP batch-feed unit, but the others are continuous feed. Those units are either 3/4 or 1 horsepower, and they are made from stainless steel parts to reduce rust and corrosion. The other two models are much more basic, and they don’t come with the added features such as sound sealing or extra grinding power. The smallest model is a ½ horsepower unit that comes with a quick mounting bracket and overload protection. The higher you go regarding performance, the better warranty you get. For example, the 1 HP Superba Continuous Feed Model has a seven-year plan that covers parts and labor, while the basic ½ HP unit comes with only a one-year warranty. These service plans do not cover installation, and they must be conducted in the home, rather than sending your broken disposal out for parts. There are three ways to get in touch with KitchenAid, and they are email, phone, or live chat. Be sure to use their services for large appliances, as disposals are not considered countertop or kitchen tools. You can register your unit online for all warranty information, and you must contact the company if you wish to have any repairs done. Out of all the companies on this list, GE is the both the oldest and the most diverse. Founded in 1892, this company currently manufactures products in a wide array of industries, from electronics to renewable energy. It is based in Boston, Massachusetts, and has offices in 180 countries. Like KitchenAid, the diversity of GE’s product line means that its disposals are not built to last as long as those made by companies that specialize in them, such as Waste King. There are nine different disposal units that GE offers; one of them is a batch-feed model while the rest are continuous feed. The notable thing about these disposals is that they are usually compact or thin, meaning that they can fit under most sinks without any problems. The models range from ⅓ to 1 horsepower, and they all come with GE’s patented Quick Lock mounting system for easy installation and replacement. Each unit is made of stainless steel components, although some models have galvanized steel impellers. Another primary feature is an overload protector, and many of them come with a removable splash guard and power cord. Overall, the differentiation between disposals is usually based on the size of the grinding chamber and the amount of horsepower. Depending on the model you get, you may qualify for up to a six-year warranty. No matter what, each disposal is covered for one year from the date of purchase, but higher end units can come with an additional one, two, four, or six years based on the product number. You can register your warranty online for expediency, but it will still count from the purchase date, not the day you register. Each warranty only covers essential repairs related to the standard operation of the machine, and they do not include installation or removal. You can contact GE online through email or live chat, or you can call the service hotline between 7a.m.-10p.m. Monday through Friday, and 8 a.m. to 6 p.m. on weekends. There is also a separate number for parts and accessories if you need to order something else for your disposal.